"Colegio Modelo de la Costa" was founded in 1993 in Cartagena de Indias, Department of Bólivar. Classes started on 5 February 1994. The flag of the institute, as shown graphically on the website of the institute, is divided yellow-blue by a SW-NE diagonal with a black letter "M" in the middle. "Corporación de Estudios Tecnológicos del Norte del Valle, COTECNOVA (English: Technological Studies Corporation of the North of the Valley) was established as Centro de Estudios Superiores (English: Center for Higher Studies ) or Centro Universitario del Norte del Valle (English: University Center of North Valley ), through Ressolution No. 3712 of September 21, 1971 by the Government of the Department of Valle. It is located in Cartago and it is a higher educational institution." 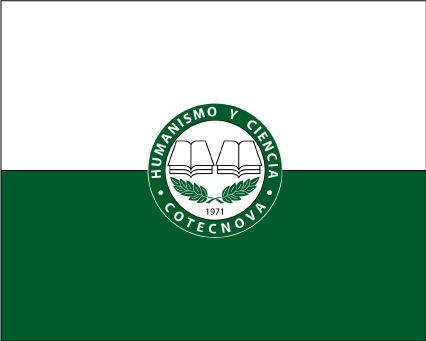 Its flag is a horizontally and equally divided flag, with two colors (white on top and green on bottom) with the coat of arms in the middle, as seen here: http://www.cotecnova.edu.co/wp-content/uploads/2016/06/bandera.png (source: https://www.cotecnova.edu.co/index.php/quienes-somos). It measures 1.20 m wide by 1.50 m tall. Colegio Creadores del Universo was established in February 2000 in Bogotá. The flag of the institute is horizontally divided blue-green. Blue represents basic good acts and emphasis put on values. Green represents aspiration to contribute to the building of a better country. Colegio de Cristo was founded on 31 May 1907 in Manizales (Caldas Department) by the Marist Brothers. The College originally succeeded the parish's school of the same name located in the Bishop's palace. The flag of the institute, as used during the schools' parade held on 7 August 2000 in Manizales, is horizontally divided dark yellow-white-red. "Colegio 'Cristóbal Colón'" was founded 23 years ago in Bogotá. 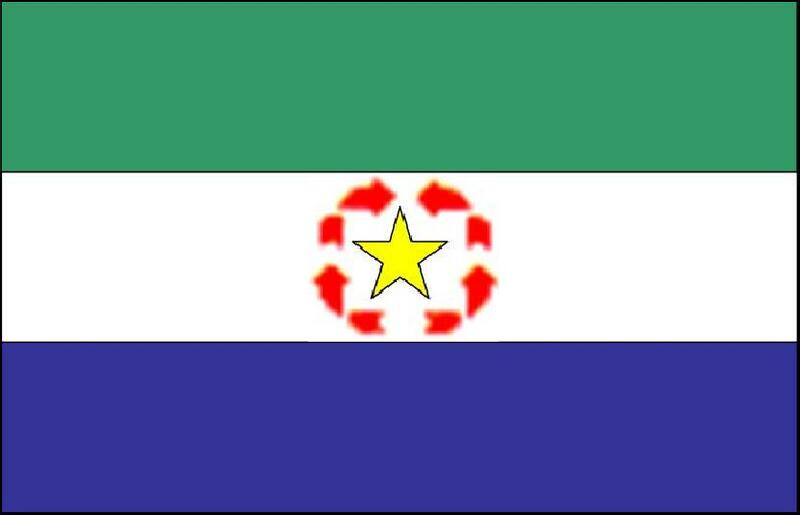 The flag of the institute, as shown graphically on the website of the institute, is horizontally divided green-white-blue with, in the middle of the white stripe, a yellow star surrounded by four red curved arrows. On the emblem of the institute, the four arrows link "science and culture", "knowledge", "technology" and "benefits" to "love" and "peace". Institución Educativa Cristóbal Colón (CRISCOL) is located in Montería (Córdoba Department). The flag of the institute is quartered blue-green-red-white, with a yellow star in the middle and an arch of six smaller yellow stars above it. Blue is a symbol of the sea and of the air. White is a symbol of purity, peace, and tranquillity. Green is a symbol of the agriculture and forest resources, and of the collective compromise for the preservation of the natural environment. Red is a symbol of love, joy, felicity, aspiration to live, and sacrifice. The central star represents the institute. The six smaller stars represent the six components of the institute (Escuela Urbana mixta Cristóbal Colón, Colegio Municipal de Bachillerato Cristóbal Colón, Colegio de Bachillerato Nocturno Pablo Neruda, Escuela Urbana Mixta "Pablo VI", Escuela Urbana Mixta "El Prado", and Escuela Urbana Mixta "Gabriela Mistral"). Escuela Normal Superior Cristo Rey was established in 1961 in Barrancabermeja (Santander Department) by Paulina Albornoz Rangel, Director of Instituto Técnico Femenino. In 1966, the management of the school was transferred to the Hijas del Cristo Rey, a congregation established in Spain in 1876 by José Gras y Granollers (1834-1918); Mother Gloria García de Codes served as the Director until 1977. The flag of ENS Cristo Rey is horizontally divided white-red with the school's coat of arms in the center. Institución Educativa Cristo Rey originates in Instituto Popular Cooperativo Guayabal, established on 29 December 1967 by Ordinance No. 18 in the Cristo Rey borough, Guayabal, Medellín, Antioquia Department. The establishment of the institute was pushed by Father Gabrial Angerl Correa, who offered a garage owned by the parish as the first classroom, inaugurated in February 1968. The institute was renamed Liceo Departamental Mixto Guayabal in 1974. Institución Educativa Cristo Rey was established on 27 November 2002 by Resolution No. 16,308, as the merger of Liceo Departamental Mixto Guayabal and Escuela Cristo Rey. The flag of the institute is horizontally divided yellow-green with the institute's coat of arms in the center. The coat of arms of the institute was adopted in 1983 in a contest open to the whole educational community. The winning designed was submitted by Carlos Palacio and Jaime Murillo. The shield is surmounted by a condor with spread wings, as a symbol of liberty, holding in the claws a scroll inscribed with the motto "Libertad, Ciencia y Deporte" (Liberty, Science and Sports). The shield is surrounded by blue ornamentation, as a symbol of the clouds and aspiration to excellence. Liceo Pedagógico Cundinamarca was established in 1987 in borough Ubate, Soacha (Cundinamarca). The flag of Liceo Pedagógico Cundinamarca is blue with a white cross superimposed with a broader, gray cross. Blue is a symbol of justice, passion, compromise, belonging, honesty, loyalty and charity. The white cross is a symbol of the tree of life and of the way to supreme divinity. White is a symbol of the light offered by Jesus Christ and the church, and by good education, as well. White is also a symbol of kindness, innocence, purity, chastity, perfection, and faith. The gray cross is a symbol of integrity, obedience, firmness, vigilance, eloquence and self-control. White and blue are also the colors of the Blessed Virgin, especially of the Immaculate Conception, and the main symbol of the Christian religion. The two crosses are superimposed to stress that Marian faith is implicit in the Christian faith. The gray color, which properly represents the Christian religion, is placed above the white one to highlight the hierarchy of the faiths. Universidad Colegio Mayor de Cundinamarca was established in 1993 in Bogotá by Law No. 91, succeeding Colegio Mayor de Cultura Femenina de Cundinamarca (est. on 17 December 1945 by Law No. 48), renamed as Colegio Mayor de Cundinamarca in 1980 by Decree No. 83 and Institución Universitaria Colegio Mayor de Cundinamarca in 1988. UCMC is composed of the Faculties of Administration and Economy, Social Sciences, Engineering and Architecture, Health Sciences, and Law. Green is a symbol of professional development, personal and institutional as well, aimed at progress and service, made of an harmonious balance between aspiration and reality. White is a symbol of institutional ethics, integrating the ethical and moral components of harmonization with mystics, loyalty, responsibility and respect, together with the self affirmation of the institutional spirit and nature, as a perfect balance between the dimension of the service and the limits of perfection. Red is a symbol of human development, implying vitality in action, commitment to work, fraternity and joy of the youth, which constitutes a compact unit, whose dynamics is projected with force and spontaneity to a dimension of commitment to service. The coat of arms of UCMC is prescribed by Agreement No. 24, adopted on 29 September 1995 by the Executive Board. The open book placed on a pedestal and surmounted by a rising sun symbolizes the firms foundations of education provided at the university with energy, dynamism and a wide vision of the future. The yellow scroll placed beneath the shield is inscribed with the three basic principles of the university: Ethics, Service and Knowledge. At www.unicundi.edu.co there is the official Coat of Arms of the Universidad de Cundinamarca (Cundinamarca University) and an isotype. I think that the flag of the UDEC (acronym of the University) is the same flag as the Cundinamarca Department, but with the UDEC Coat of Arms in the center. "Universidad de Cundinamarca" (UDEC) was recognized on 30 December 1992 by the Ministry of National Education (Decree No. 19530), succeeding, as a university, "Instituto Universitaria de Cundinamarca" (ITUC), recognized on 19 December 1969 by the Ministry of National Education (Decree No. 045). The flag of UDEC, as shown graphically and described on the UDEC website, is white with the shield of UDEC in the middle. White represents the light that enlightens and guide us, as presented in the motto of UDEC, "Ex umbra in solem" (in Latin, "From darkness to light"). White also represents the purity of thought, ethics, equity, loyalty, integrity, obedience, dignity, eloquence and triumph, characteristics of the UDEC community. The shield of UDEC, placed in the middle of the flag represents the commitment to permanently unite in the academic and scientific development the cultural tradition, inclusion, social projection and transparent governance to the service of the community. The flag is one of the most representative symbols of UDEC, used in graduation ceremonies, inauguration of academic events and commemorations. The graduates of UDEC shall take the oath on the flag. The flag shall be half-staffed after the death of students, professors or administrators of UDEC, and may cover their coffin. The shield of UDEC is oval, with, on a golden background, a sun, symbol of life and source of all kind of existence, surrounded by 15 points representing the 15 provinces forming the Department of Cundinamarca. as a symbol of cultural tradition, inclusion, social projection and transparent governance to the service of the community, contrasting with the green disk forming the center of the shield and the green border framing it. Gold represents wealth, strength, nobleness, faith, constancy, the sun and fire. Green represents life strength, the natural environment, work, growth, serenity, abundance, victory and immortality. It is the colour of permanent production. The sun is a symbol of life, eternity, greatness, with the green center meaning growth and future. Its location in the middle of the shield recalls us the commitment to achieve our dreams and reach our objectives. In the center of the sun is a stylized map of the department, outlined with the colours of the flag of the department (blue, yellow and red), recalling the origin of the UDEC. The green border represents our field protected by discipline, inflexibility and scientific knowledge. A scroll placed under the shield bears the motto "Ex umbra in solem", in Latin, "From darkness to light", which can be philosophically extended to "From ignorance to knowledge". This is the former emblem of UDEC, possibly placed on a flag, but both the emblem and flag have clearly been superseded by the current symbols.